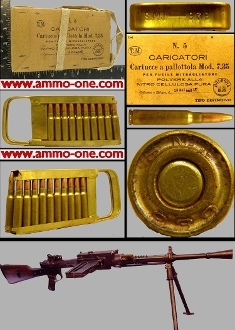 One Italian Breda 30 machine gun Loaded Charger by SMI (Societa Metallurgica Italiana) of Italy in 1938 with 20 (7.35 Carcano) cartridges . The charge has a stamp on the handle “S.M.I. 939. Loaded with 20 (7.35mm cartridges, with " SMI 939” Head Stamps, and the projectiles appear to be copper coated, plated steel jacketed projectile. Very Nice Condition! Only 4 sales available.